News last month that the remains of early 19th century explorer Matthew Flinders had been found beneath Euston railway station. But just who was Flinders and what, aside from being the location of his burial, were his connections to London? 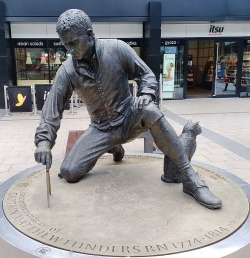 Flinders was not a native Londoner by birth – he was born on 16th March, 1774, in Donington, Lincolnshire, the son of a surgeon-apothecary and educated in local schools. He joined the Royal Navy at the age of 15, serving first on HMS Alert as a lieutenant’s servant and several other ships including the HMS Providence, captained by William Bligh (of mutiny on the Bounty fame) on a voyage taking breadfruit from Tahiti to Jamaica. He also subsequently saw action while on the HMS Bellerophon in 1794, when the ship was involved in the Battle of the Glorious First of June against the French in the English Channel. In 1795, he served as a master’s mate on the HMS Reliance which sailed to New South Wales with the mission of delivering its new governor, John Hunter. As well as establishing a reputation as a navigator and cartographer on the voyage, he became friends with the ship’s surgeon George Bass. After arriving at Port Jackson in New South Wales, Flinders undertook two expeditions with Bass in small boats dubbed the Tom Thumb and Tom Thumb II – the first to Botany Bay and the Georges River and the second to Lake Illawarra. In 1798, now a lieutenant and based in New South Wales, Flinders was given command of the sloop Norfolk with the aim of proving Van Diemen’s Land (now the state of Tasmania) was an island. He did so and named the strait between it and the Australian mainland after his friend Bass (the largest island in the strait would later be named Flinders Island). In 1799, he sailed the Norfolk north to Moreton Bay before in March, 1800, returning to England on the Reliance. Thanks to the advocacy of Sir Joseph Banks, to whom Flinders had dedicated his text Observations on the Coasts of Van Diemen’s Land, on Bass’s Strait, etc, in January, 1801, Flinders was given command of HMS Investigator and, subsequently promoted to commander, given the mission of charting the coastline of the Australian continent, then known as New Holland. Having married his longtime friend Ann Chappelle on 17th April, 1801, he set sail for New Holland on 18th July of that year (without Ann – he had intended taking her on the journey but ordered to remove her from the ship by the Admiralty). Flinders reached and named Cape Leeuwin in what is now Western Australia on 6th December and then proceeded eastward along the continent’s southern coast. He met the French explorer Nicolas Baudin, aboard the Geographe, in what he named Encounter Bay, named Port Lincoln and Kangaroo Island in what is now South Australia and further to the east spent time exploring the environs of Port Philip Bay (around the modern city of Melbourne). He proceeded north to Sydney, arriving on 9th May, 1802, setting sail again on 22nd July. Heading northward, he surveyed the coast of what is now Queensland before, having charted the Gulf of Carpentaria, discovering his ship was badly leaking. Unable to undertake repairs, he decided to return to Sydney but did so via the west coast of the continent, thus completing the first documented circumnavigation of it. Back in Sydney, the Investigator was found to be unseaworthy and condemned. Unable to find another vessel to continue his explorations and hearing of his father’s death and wife’s illness back in England, Flinders looked return home as a passenger aboard the HMS Porpoise. But the Porpoise was wrecked on the Great Barrier Reef and Flinders undertook the role of navigating the ship’s cutter back across open sea to Sydney so the remainder of the ship’s crew could be rescued. He was then given command of the HMS Cumberland to return to England but the poor condition of that ship forced him to put into the French controlled Isle de France (Mauritius) for repairs on 17th December, 1803. War had broken out between England and France and Flinders was detained (it was during his period of detainment – he was allowed to venture around the island after the first few months – that he sent back to England a map of the Australian continent, the only one in which he used the name “Australia” for the title. While he wasn’t the first to use the name Australia, he is credited with popularising it). Flinders wasn’t released until June, 1810, after a Royal Navy blockade of the island (despite being granted his release by the French Government in 1806, authorities on Mauritius decided to keep holding him). Travelling via the Cape of Good Hope, he returned to England where he was promoted to post-captain. On returning to home, Flinders, now in poor health, and his wife Ann lived at several rental properties in London – there’s an English Heritage Blue Plaque on one former property at 56 Fitzroy Street in Fitzrovia, central London – and had a daughter Anna (her son Matthew Flinders Petrie, later Sir Flinders Petrie, would go on to become a famous archaeologist and Egyptologist). It was during this period that Flinders wrote a book about his voyages, A Voyage to Terra Australis. It was published on 18th July. Remarkably, Flinders died of kidney failure just a day later. He was buried on 23rd July in the graveyard of St James’s Church, Piccadilly, which was located up in Camden. The location of his grave was later forgotten when the headstone was removed and the site became gardens, part of which were subsequently built over by Euston station. Famously, of course, his body was found last month during excavations conducted ahead of the construction of the Euston terminus for the high-speed rail link, HS2, between London and Bristol. Flinders legacy lives on in the more than 100 geographical place names bearing his moniker in Australia including the iconic Flinders Street Railway Station in Victoria and the Flinders Ranges in South Australia. There’s also a statue of him in his home town of Donington and in July, 2014, the 200th anniversary of his death, a large bronze statue by Mark Richards depicting Flinders and his cat Trim (we’ll deal with Trim’s story in an upcoming post) was unveiled at Australia House by Prince William. It was later installed at Euston Station near where his grave was assumed to be (pictured above). 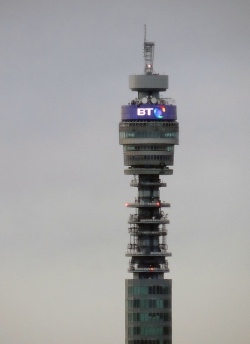 Loved and loathed by Londoners over the years since its construction in the mid-Sixties, the column-like BT Tower, despite growing competition, remains a dominant feature of the city’s skyline. The tallest building in Britain at the time of its official opening in 1965, the 189 metre tall structure (including a 12 metre tall mast) was commissioned by the General Post Office to support microwave aerials which carried communications from London to the rest of the UK. Designed by a team led by architect GR Yeats under the direction of Eric Bedford, chief architect of the Ministry of Public Buildings and Works, its narrow, tubular shape was engineering to reduce wind resistance and ensure stability. 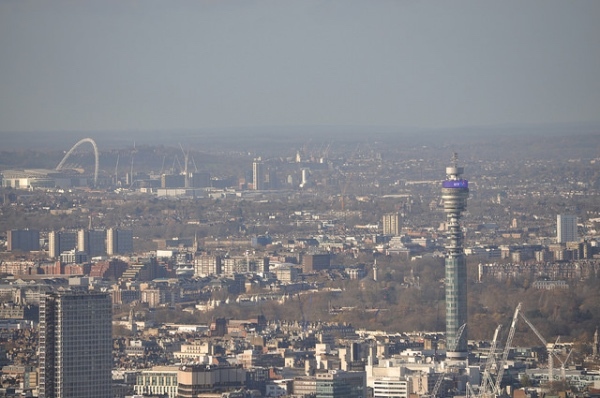 Construction of the tower started in June, 1961, and some 13,000 tonnes of steel and 4,600 square metres of specially treated glass were used in building the £2.5 million tower. Along with the aerials capable of handling up to 150,000 simultaneous telephone calls and 40 TV channels, the tower also housed 16 floors of technical and power equipment, as well as other floors with offices and even a revolving restaurant on the 34th floor (it made one revolution every 22 minutes). PM Harold Wilson did the honours of officially declaring the tower open on 8th October, 1965. Queen Elizabeth II’s first visit would come on 17th May, 1966, just two days before then Postmaster General Tony Benn opened the tower’s public areas – an observation gallery and a 34th floor cocktail bar and restaurant, called Top of the Tower, which was managed by Butlins. More than 50,000 visited the observation gallery in the first three weeks after its opening. A bomb exploded in the men’s toilets on the 31st floor – the location of the viewing gallery – in October, 1971, and took two years to repair. Despite this – no-one has apparently ever claimed responsibility for the bombing, public areas continued to remain open until the restaurant closed in 1980 and access to the observation gallery ceased in 1981 (although the restaurant is still used for corporate and charity events). 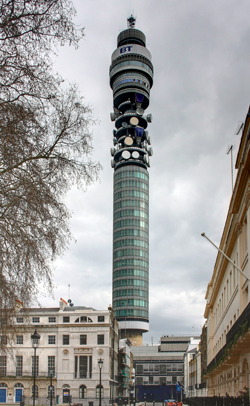 Originally known as the Post Office Tower, the tower has had many other official names since it was built including the Museum Tower, the London Telecom Tower and the BT Tower while staff suggestions at the time it was being constructed included the Pointer, Spindle, Liaiser and Telebeacon. Interestingly, the tower was apparently designated an official secret when built and didn’t appear on Ordnance Survey maps until after MP Kate Hoey, following on from other members who had “given examples of seemingly trivial information that remains officially secret”, told Parliament of its address – 60 Cleveland Street – in February, 1993. The now Grade II-listed tower, which is located just off Tottenham Court Road in Fitzrovia, remained the tallest building in London until it was overtaken by the NatWest Tower in 1980. The last of its famous satellite dishes were removed in 2011. Its wrap-around LED light display, officially called the Information Band, went live in 2009. It has since carried special messages on occasions like Remembrance Day and Valentine’s Day as well as an Olympic countdown and even the first ever tweet sent by the Queen (a message to mark the opening of the BT-sponsored ‘Information Age’ communications gallery at the Science Museum in 2014). The tower has featured numerous times in literature and film, the latter including Harry Potter and the Chamber of Secrets. • The annual festival of illumination known as Lumiere London returns to the capital for a second time from tonight with more than 50 installations lighting up streets, buildings and public spaces. London’s largest night-time festival, installations in this year’s free event – commissioned by the Mayor of London and produced by arts charity Artichoke – are clustered around six areas: King’s Cross, Fitzrovia, the West End, Mayfair, Westminster and Victoria, and South Bank and Waterloo. The installations include Lampounette – located in King’s Cross, it features giant office desk lamps, Entre les rangs – a field of thousands of flower-like reflectors in Lewis Cubitt Park, Nightlife – a luminous secret garden in Leicester Square which plays with the relationship between wild spaces and urban city life and spills out to include illuminated flamingoes flying over Chinatown, and Northern Lights – a recreation of the aurora borealis in Grosvenor Square, Mayfair. The facade of Westminster Abbey is also among the buildings to be lit up with artist Patrice Warrener commissioned to illuminate the Abbey’s West Towers and Great North Door with his work, The Light of the Spirit. There’s a free app to download and a map can be purchased online for download. 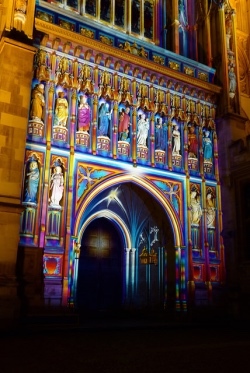 For more, include a complete programme, head to www.visitlondon.com/lumiere. PICTURE: Westminster Abbey during Lumiere London last year (Paula Funnell/licensed under CC BY-NC-ND 2.0). • London’s future built form is up for discussion at a new exhibition opening at the Museum of London tomorrow. London Visions: Hypothetical scenarios of a future presents hypothetical concepts created by leading artists, architects and designers using video installations, architectural narratives and video games. Among the key works on display are: Flooded London – a series of images created by Squint/Opera depicting imaginary scenes of London in 2090 when rising seas have flooded the city; In the Robot Skies: A Drone Love Story – the world’s first narrative shot entirely by autonomous drones operating on autopilot, the film – directed by speculative architect Liam Young and written by Tim Maughan – looks at the possible future use of drones within London council estates; and, Endless Vertical City – a competition-winning design by SURE Architecture which envisions a skyscraper that could house the whole of London. The free display is on show until 15th April as part of City Now City Future, the year-long season of events exploring urban evolution in London and around the world. For more, see www.museumoflondon.org.uk/citynowcityfuture. 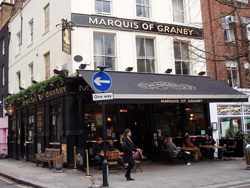 This Fitzrovia pub, famous for its literary connections (more about those in a moment), takes its name from a popular 18th century military hero. John Manners, the Marquis of Granby, played a key role for Britain during the Seven Years War – between Britain and her allies and France and hers – and, thanks to his popularity among the soldiers who served under his command, had numerous pubs named for him (he apparently also had a hand in setting up many old soldiers as publicans). In his most famous battlefield exploit, while leading a series of cavalry charges at the Battle of Warburg in 1760 (in actions which saved the day), he apparently lost his hat and wig and was forced to salute his commander, Prince Ferdinand of Brunswick, without them. All of which explains why the pub sign doesn’t show him wearing a hat and why soldiers from his former regiment, the Blues and Royals, have the unique privilege in being able to salute while not wearing headwear. The fact Manners was bald also apparently led to the coining of the phrase, “going at it bald-headed” – a reference to his fearlessness. The pub, located at 2 Rathbone Street (on the corner with Percy Street – the address was formerly known as 38 Percy Street), is famous for its literary clientele during the years between the two World Wars – among those who drank here were writers Dylan Thomas and TS Eliot. They apparently shared the space with some low-level gangland figures. 1. William Wilberforce (1759-1833). The late 18th century and early 19th century politician and anti-slavery campaigner tops our list with three English Heritage blue plaques. The first is at 111 Brookwood Road in Battersea – the site of Brookwood House where Wilberforce resided during his anti-slavery campaign. 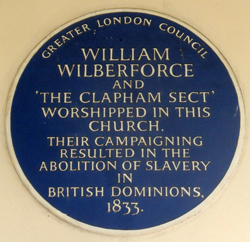 The second is on Holy Trinity Church on Clapham Common, the church where Wilberforce and the Clapham Sect with whom he is associated worshipped. And the third is on a property at 44 Cadogan Place in Chelsea where Wilberforce died. 2. Dr Samuel Johnson (1709-1784). Like Wilberforce, the 18th century lexicographer Dr Johnson has three English Heritage blue plaques to his name. The first, on his famous Gough Square property in the City of London we’ve already mentioned (see our earlier post here), while the second is on a property at 8 Russell Street, Covent Garden, then occupied by bookseller Thomas Davies, which was where Dr Johnson famously first met James Boswell in 1763. The third time Dr Johnson’s name appears, more unusually, is on a plaque commemorating Essex Street – Dr Johnson is among a number of names listed on it for his role in establishing an “evening club” at the pub, the Essex Head, in the street in 1783. 3. Samuel Pepys (1633-1703): The 17th century diarist seems to pop-up everywhere in central London so it’s not surprising there are two plaques in the English Heritage blue plaques scheme dedicated to him (although both are located in the same street – one he apparently liked very much). The plaques are located at number 12 and number 14 Buckingham Street in Covent Garden and both mark the site of a Pepys residence. 4. Virginia Woolf (1882-1941): The writer, publisher and literary critic’s name appears on two properties – at 29 Fitzroy Square in Fitzrovia where Woolf lived between 1907-1911 and on Hogarth House at 34 Paradise Road in Richmond where she and Leonard Woolf lived between 1915-1924 (and also where they founded the Hogarth Press in 1917). 5. William Morris (1834-1896): The poet and artist has two English Heritage blue plaques to his credit – the first on 17 Red Lion Square in Holborn where Morris lived in a flat from 1856-1859 with Sir Edward C Burne-Jones, and the second on Red House in Bexleyheath where he and his wife Jane Burden lived from 1860-1865. • A once forgotten collection of watercolour paintings and drawings owned by Empress Catherine the Great of Russia has gone on show at Hampton Court Palace as part of commemorations marking the 300th anniversary of the birth of Lancelot ‘Capability’ Brown. The Empress and the Gardener exhibition features almost 60 intricately detailed views of the palace and its park and gardens during the time when Brown worked there as chief gardener to King George III between 1764 and 1783. The works came to be in the collection of the Empress – a renowned fan of English gardens – after Brown’s assistant, John Spyers, sold two albums of his drawings of the palace to the her for the considerable sum of 1,000 roubles. The albums disappeared into her collection at the Hermitage (now the State Hermitage Museum) and lay forgotten for more than 200 years before they were rediscovered by curator Mikhail Dedinkin in 2002. As well as the collection – on public show for the first time, the exhibition features portraits of Brown and the Empress, previously unseen drawings of her ‘English Palace’ in the grounds of the Peterhof near St Petersburg, and several pieces from the ‘Green Frog’ dinner service, created for the Empress by Wedgwood, which is decorated with some of the landscapes the prolific Brown created across England. Runs until 4th September. Admission charge applies. For more, see www.hrp.org.uk/hampton-court-palace/. • A house in Chelsea has become only one of 19 homes in London to bear two official blue plaques. Number 48 Paultons Square has the honour of having been home to two Nobel prize winners (albeit in different fields) – dramatist Samuel Beckett, who lived there for seven months in 1934 while writing his first novel, Murphy, and physicist Patrick Blackett, noted for his revolutionary work in U-boat detection during World War II, who lived there from 1953 to 1969. Other ‘doubles’ include 20 Maresfield Gardens in Hampstead (home to Sigmund Freud and Anna Freud) and 29 Fitzroy Street in Fitzrovia (home to George Bernard Shaw and Virginia Woolf). This year marks the 150th anniversary of the blue plaques scheme. For more, see www.english-heritage.org.uk/visit/blue-plaques/. • The rise of the British graphic novel is the subject of a new exhibition at the Cartoon Museum in Bloomsbury. The Great British Graphic Novel features works by 18th century artist William Hogarth as well as Kate Charlesworth, Dave Gibbons (one of the creators of the ground-breaking Watchmen), Martin Row, Posy Simmonds (creator of the Tamara Drewe comic strip) and Bryan and Mary Talbot. It runs until 24th July. Admission charge applies. For more, see www.cartoonmuseum.org. • It includes everything from the iconic Lloyd’s Building in the City to the former Strand Union Workhouse in Fitzrovia which may have inspired scenes in Charles Dickens’ Oliver Twist and the red phone boxes which sit outside the British Museum in Bloomsbury. English Heritage this week released it’s London List 2011 which documents the more than 100 sites in London which have been awarded listed status by the organisation last year. They include 19 Underground stations (among them that of Oxford Circus, St James’s Park and Aldwych), four war memorials (including the grand Central Park War Memorial in East Ham) and two schools as well as various cemetery monuments (including at Highgate and Brompton Cemeteries, and Bunhill Fields Burial Ground) and parks (the status of Green Park was upgraded to Grade II*), religious and commercial premises, public libraries and homes. To download a copy, visit www.english-heritage.org.uk/publications/london-list-2011/. • It’s just one week to go until the Open House London weekend when more than 750 buildings of all sorts open their doors to you. We’ll be talking more about some of the special places open this year in next week’s update – this is, after all, one of our favorite London events of the year, and while, if you haven’t already entered, you’ve missed on the balloted openings, there’s still plenty of places where you can simply turn up on the day (and entry to all is free). If you haven’t already bought one, you can buy the Guide online – just follow the links from www.openhouselondon.org.uk. It can also be picked up free at some participating London libraries. • Dame Ida Mann, Oxford’s first female professor and a pioneering ophthalmologist, has been honored with an English Heritage Blue Plaque at her childhood home in West Hampstead. The plaque, which was unveiled by an Australian opthalmologist who worked with Mann, Donald F. Ezekial, last week, has been placed on a house at 13 Minster Road where Mann lived from 1902-1934. Mann was born in West Hampstead and lived there for 41 years before eventually emigrating to Australia. For more on blue plaques, see www.english-heritage.org.uk. • On Now: Motya Charioteer at the British Museum. Best be quick for this one, the charioteer, on loan from the Museo Giuseppe Whitaker on Motya, is only around until 19th September (that’s next Wednesday). The stunning statue, displayed near the sculptures from the Parthenon, dates from about 460-450 BC and is generally credited as one of the finest examples of Greek marble sculpture to have survived down the ages. It is believed to depict the winner of a chariot race and is likely to have been commissioned to commemorate a victory by a participant from one of Sicily’s Greek cities. It was found in Sicily in 1979. Admission is free. For more, see www.britishmuseum.org.